This post is brought to you by Big Fish Games and their brand new game, Fairway Solitaire Blast. All opinions are our own. While I couldn’t tell you the first thing about the kind of golf you play on a huge green lawn, I am totally addicted to a solitaire game called Golf. The game is so simple: you lay out a set number of cards in a pattern on the table. Then you draw a card from the deck to start with and try to go one up or down. For example, if you draw a 7, look on the table for a 6 or 8. Try to get a streak going either one higher or lower. So if you had an 8, you could go 9, 10, Jack, Queen- then back down, Jack, 10, 9- and up again. Believe me, it’s a lot harder to explain than it is to play! Fairway Solitaire Blast: Not Your Average Golf Game! I really love when golf solitaire games take game play to a whole new level by giving me power ups and other fun bonuses. Fairway Solitaire Blast does just that. 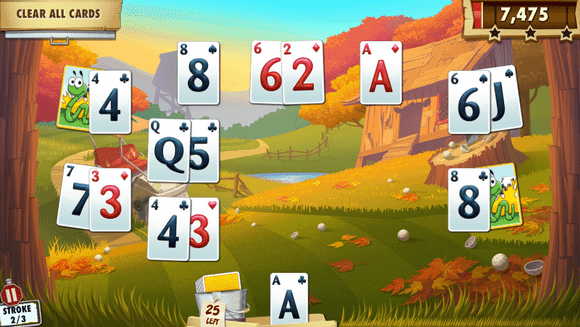 This isn’t your typical monotonous solitaire game! When you load up Fairway Solitaire Blast on your Android, Amazon or Apple device, you’ll quickly see just how exciting golf solitaire can be! Your mission is the same as you’d expect for a golf game: clear all the cards. How you accomplish that, though, is where the fun really begins! Check out the trailer, complete with snazzy music! What makes Fairway Solitaire Blast from Big Fish different? First, it offers 90 levels of fun yet challenging game play. Plus, there are more levels on the way! What I really love about Fairway Solitaire Blast is how they manage to keep it fresh by creating new challenges in every level. 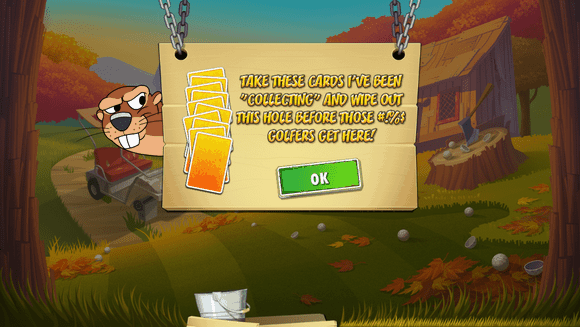 Second, it includes a crazy cast of characters, including the mischievous Gutsy McDivot, a sassy groundhog who loves creating challenges for golfers everywhere. He tasks you with a mission to clear out the cards before the troublesome golfers arrive on the green! My favorite part of the game, though is the power-up cards! Gutsy and his friends each offer different power ups to “blast” cards off the screen in a single shot. You can see them hiding behind regular cards. Just clear away the cards blocking them and you’ll have access to insanely spectacular power ups. 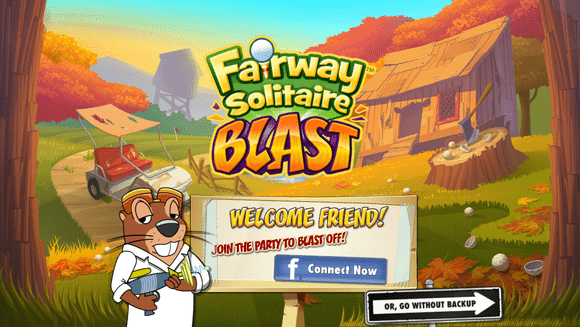 Fairway Solitaire Blast also lets you get social with game play. Connect on Facebook to track your friends’ scores and try to surpass them on the leaderboard. You know you can’t wait to knock them out of the top spots! Plus, when you create an account, you can save your progress across devices! Start a game at home while relaxing on the couch with your iPad, then pick it up on your Android phone while waiting for your kids to finish soccer practice. Since Fairway Solitaire Blast is available on in the App Store, Google Play and on Amazon for the Kindle Fire, the fun never has to stop. Load it on all your devices and you’ll always have a fun game ready to keep you busy during waits. I don’t know about you, but I am incredibly impatient while waiting in line! I need games like this to keep me sane and stop me from annoying everyone else in line with my constant foot tapping and shifting back and forth! Download Fairway Solitaire Blast through this smart link, it automatically knows which device you’re using and will direct you to the proper download location. Like Fairway Solitaire on Facebook to keep up with news and follow GutsyMcDivot on Twitter for his fun antics! I’m stuck on level 48. You have to do it without making any mistakes. But 1/2 way through the holes it sayes I’ve run out of cards to complete the challenge. Wth! Can anyone help??!! I just downloaded this game last week! I just haven’t had a chance to play it yet! It looks like a lot of fun! You’ll love it! I am already addicted! My brother would probably love this. He is always playing a golf Kinect game. I don’t know what it has to do with golf on the green either, but it sure looks like it would have my attention for hours. I usually get sucked in by these kind of games once they are downloaded – so I pass them on to my kids to keep them occupied when I’m shopping or meeting with someone! This is a double bonus for my husband. He loves golf and solitaire, so he would enjoy this game. I need to check into this app. It is loads of fun! I remember when the only solitaire game I knew about was the one that came with the old, old computers. LOL. They have so many great variations now! What a great app. My husband loves playing games like that on his phone. I’m going to recommend this one to him. I can see teens and tweens liking and app like this since it lets them be social. My nephew would really like this app and he’d especially like that you can connect with friends on Facebook!